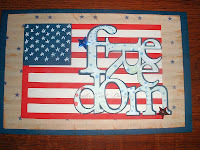 4th of July - Freedom! This card was a lot of fun! I wanted to join in on the BBTB challenge of the word freedom from graphically speaking, but I didn't have the cartridge so I designed my own in design studio using Plantin Schoolbook. I thought it turned out neat. I also asked a friend as I was making it what else I could do because my creativity hit a roadblock then she said how about a flag. I thought cool idea. I started digging through my cartridges and again I didn't have a flag, but I found one on another cartridge that I didn't have of course so I had to play again in design studio. Oh I love the fun of design studio. LOL Well, this is result of my efforts. Thank you for looking. Love your card, thanks for visiting my blog on the SNR Blog Hop.